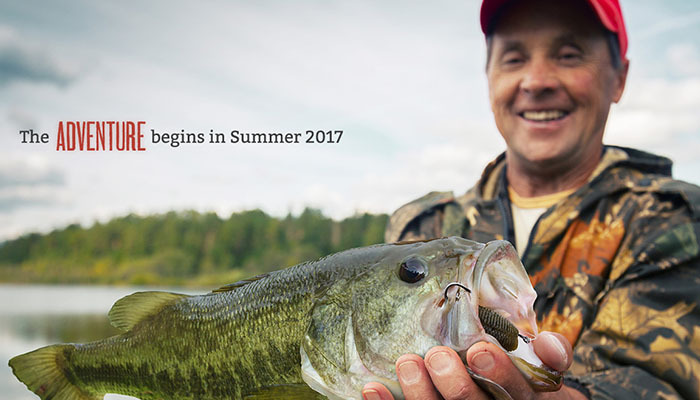 Some outdoor enthusiasts might advocate for camping as a refreshing immersion with nature without the distractions of modern technology. 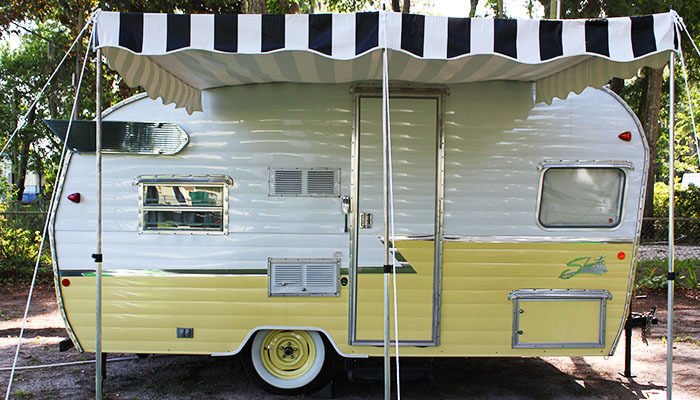 Of course, not everyone is as optimistic about spending a few nights in tent with minimal sleeping space. 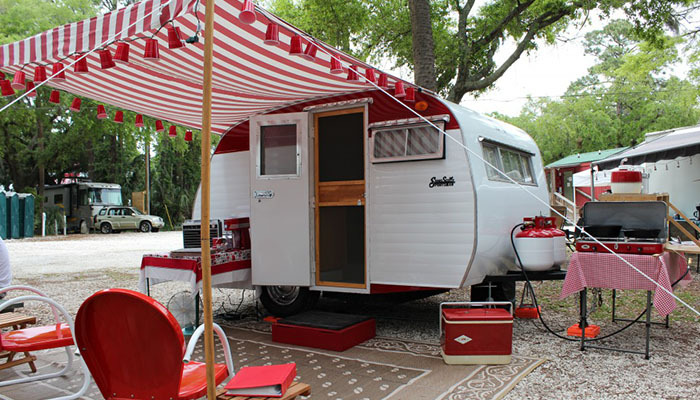 Thankfully, the art of camping is no longer confined to uncomfortably tossing and turning on the earth’s bumpy terrain; it’s complete with pools and playgrounds, free wifi and outdoor fire pits to make the experience enjoyable to everyone—the glamper and the hard-core camper. 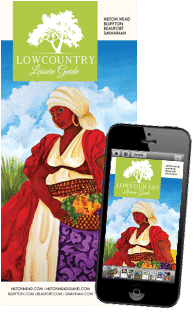 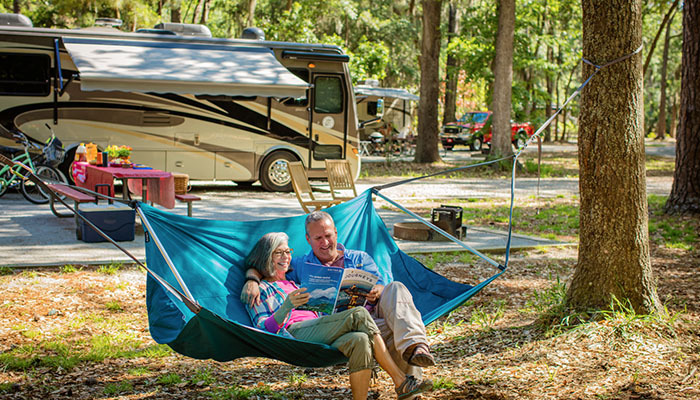 With everything from bunkbeds in cabins and extra-large sites out on a farm to small serene spots nested under towering live oak trees, camping in Savannah is a beauty to behold and an adventure to enjoy. 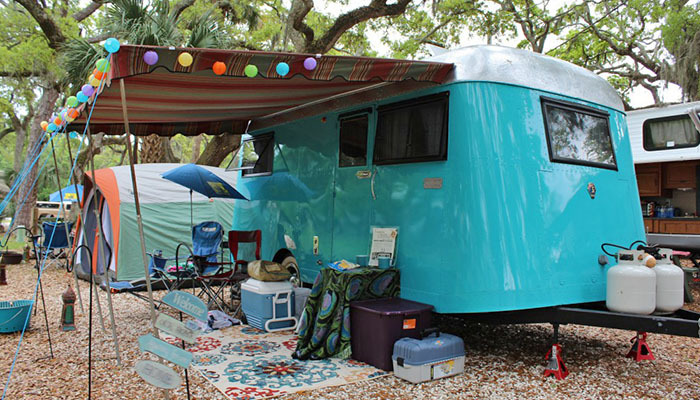 Whether you’re looking for a cozy campground in Savannah or an RV Park on Tybee Island, there are more than a few options promising memories in Savannah’s own backyard. 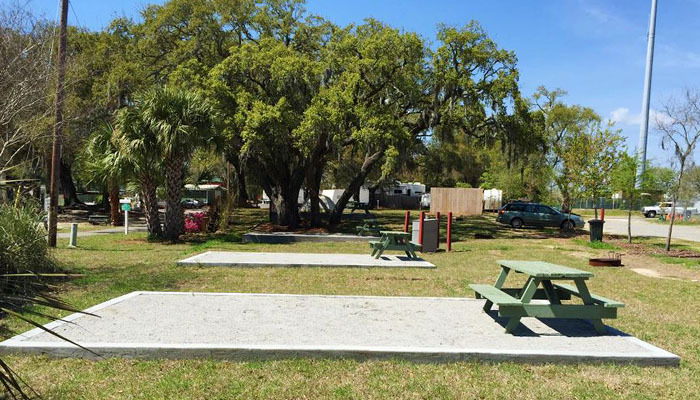 Camping in Savanah does not have to mean discomfort in the woods, and taking an RV out to sites such as Red Gate Campground is a camping-friendly alternative to “roughing it.” Opened in 2009, Red Gate proudly operates as a family-owned RV park and campground in Savannah just 10 minutes from the Historic District. 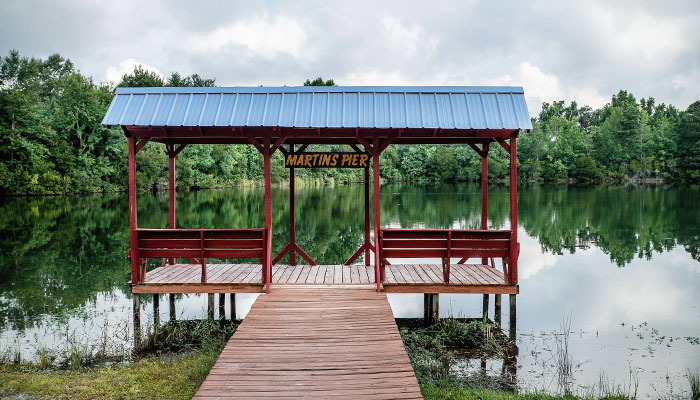 Their 200 acres of land at 136 Red Gate Farms are snuggled within a cozy backyard of Georgia Old Country, making it the perfect spot for RV enthusiasts and classic, tent-devoted campers. 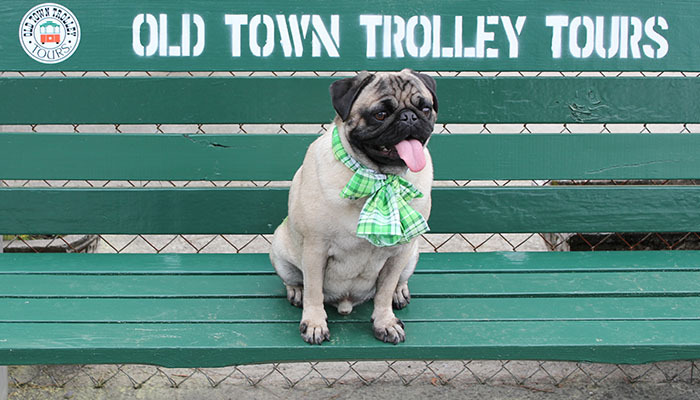 Savannah’s own Old Town Trolleys will even pick up visitors from Red Gate for a tour. 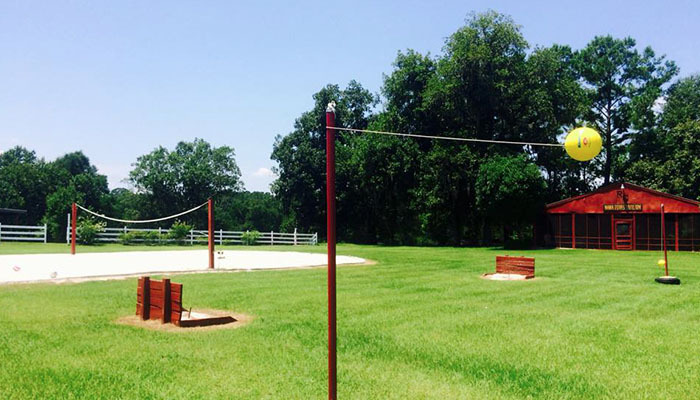 Families can embrace a natural escape from reality by fishing, playing with Red Gate’s farm animals and old-fashioned horse shoes or going on a horseback trail ride. 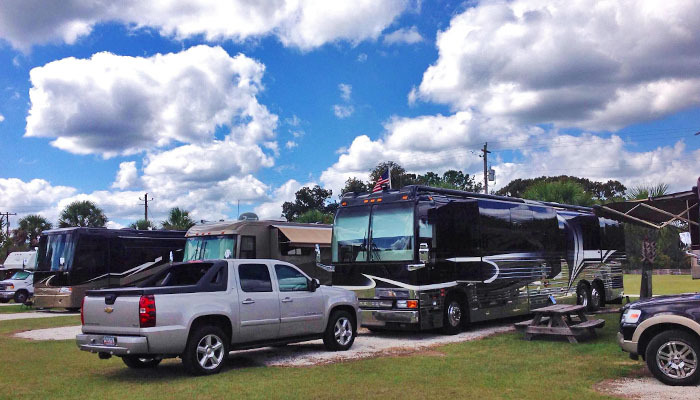 For larger RV rigs, Red Gate has over-sized sites as well as an RV Propane and LP Refill. 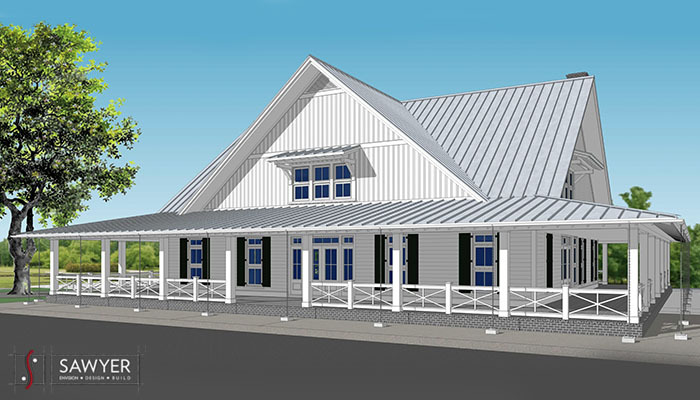 With a rustic, red three-bedroom farmhouse, a clubhouse with grills, a pool and a playground, sand volleyball and tetherball, walking and biking trails and fishing lakes, Red Gate delivers on its tagline as “Your oasis of southern charm.” Not to mention, it’s one of the sweetest spots for couples to have a romantic southern wedding, with several spaces to say I do and host the reception, including in their rustic red barn. 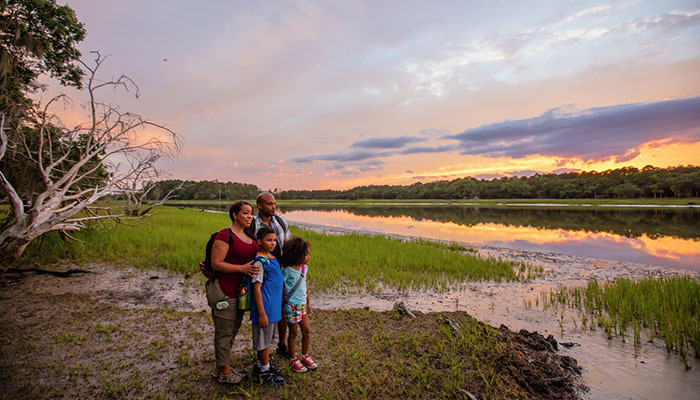 Follow Georgia’s intracoastal waterway to discover this unique maritime forest and marshland ideal for a true Southern escape. 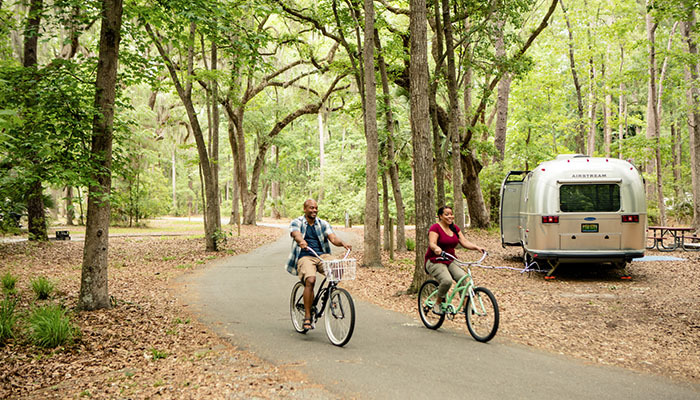 Set on 588 acres, Skidaway Island State Park is by far the largest park in Savannah, featuring three camper cabins, 87 campsites and three pioneer campgrounds for groups of 10+, not to mention the many trails perfect for biking and hiking, which edge along the marshes of Skidaway River, giving this State Park is its semi-seafaring aura. 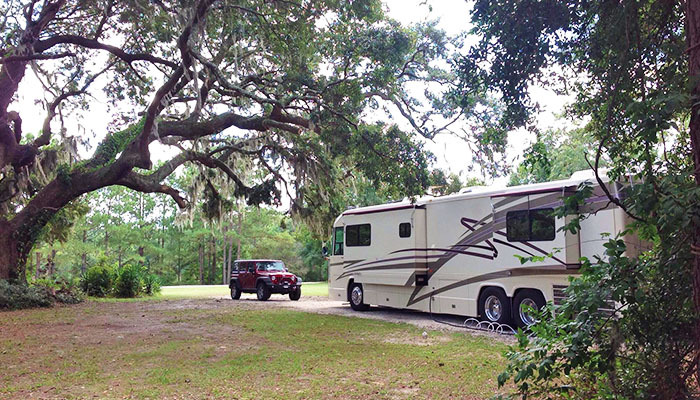 Skidaway Island State Park is for the coastal camper who wants to sleep beneath the Spanish moss and towering live oak trees. 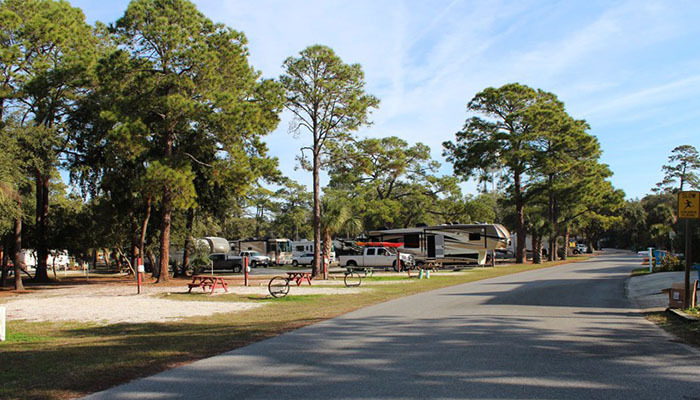 RV sites sprawl next to the park’s camper cabins, each of which have screened-in porches, air conditioning, a bathroom with a shower, a kitchen, a master bedroom and sleeping lofts for kids. 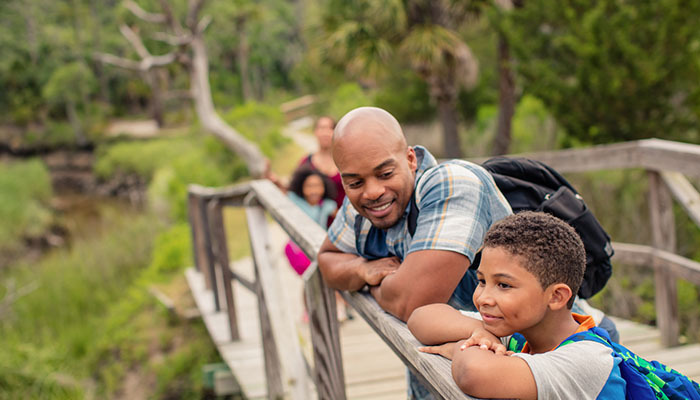 Speaking of younger campers, the Skidaway Island State Park interpretive center educates and entertains kids young and old with an observation tower to witness the local wildlife in their natural habitat (not unlike campers). 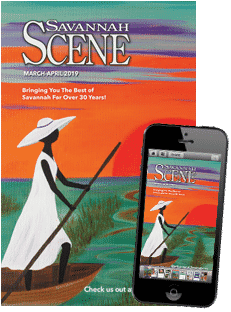 Bird watching enthusiasts can borrow binoculars and reference books to identify some of the Coastal Empire’s most fascinating species such as the Painted Bunting. 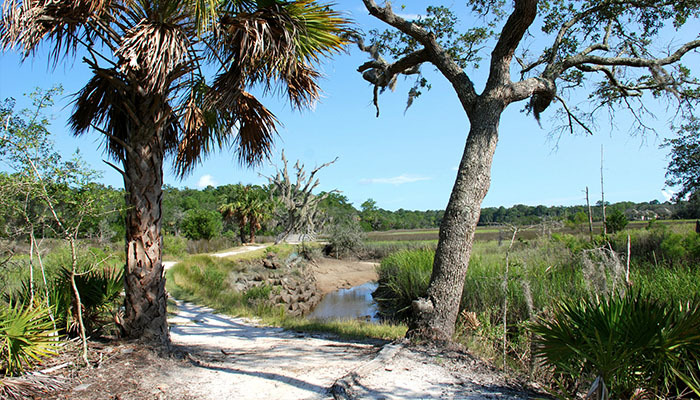 Take a guess as to why River’s End Campground is named so. 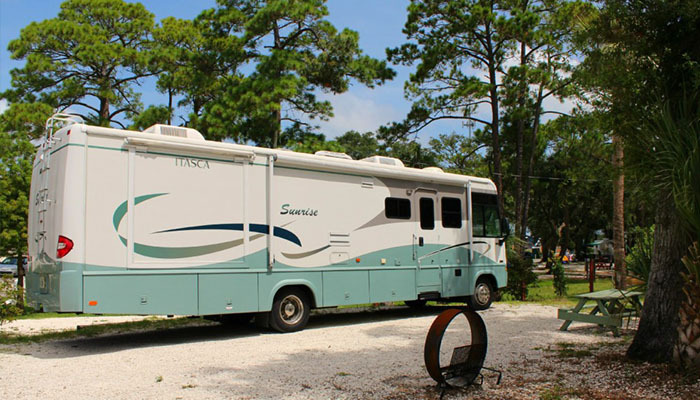 The spacious site, which sits steps away from the beach where the Savannah River meets the Atlantic Ocean, offers an abundance of services including a range of RV hook-ups and complimentary Wi-Fi for those who need just a little connection to the real world by way of the river. 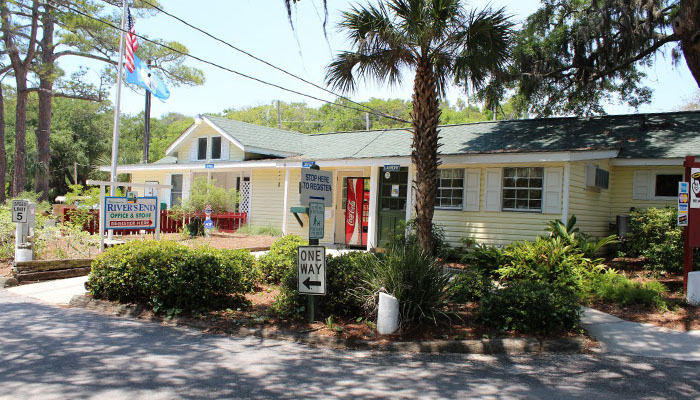 Think of it as the nucleus to the cell of Savannah and Tybee Island’s activity-filled agendas. 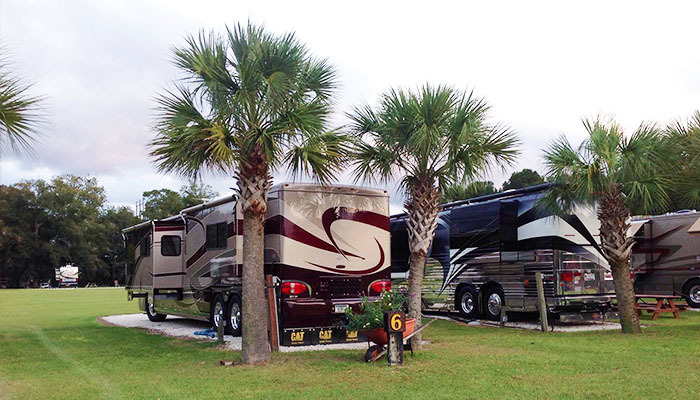 The beach bum in your camping clan can take advantage of Tybee Island’s beaches just a short stroll from River’s End’s over 100 sites, so settle in and see the South from a safe, secure view. 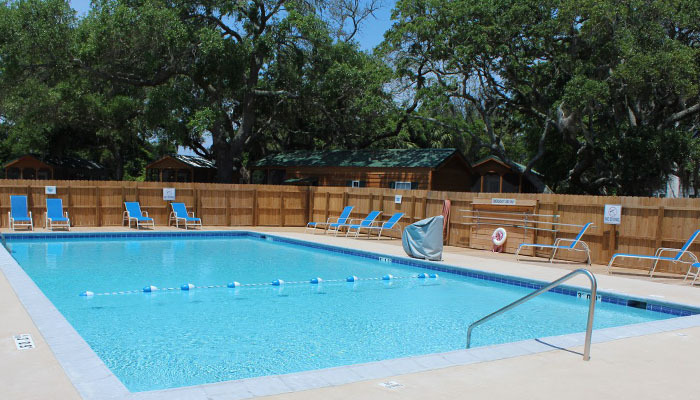 This Tybee Island campground features budget and family-friendly cabins, which can sleep parties of six and give guests the chance to customize their stay by bringing their own linens and other amenities that add the comfort of home. 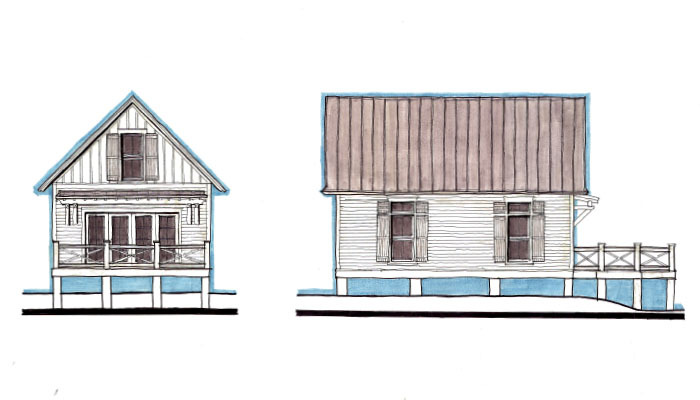 Each cabin comes with a full kitchen and bathroom, and families can congregate around a small grill and fire pit out back. 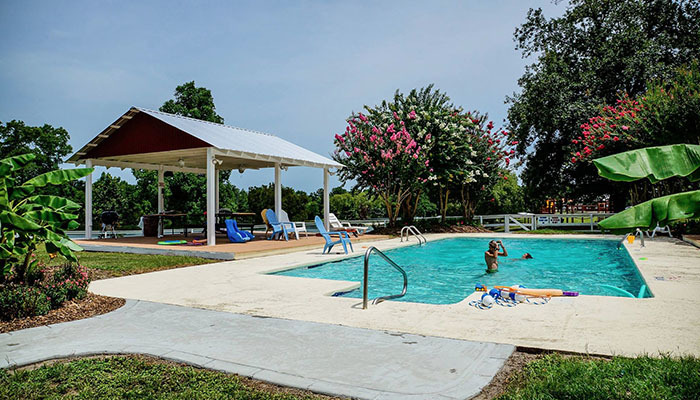 River’s End also supplies tent camping sites near RV hook-ups with all the same service access to washers and dryers and a workout facility complete with treadmills and ellipticals. 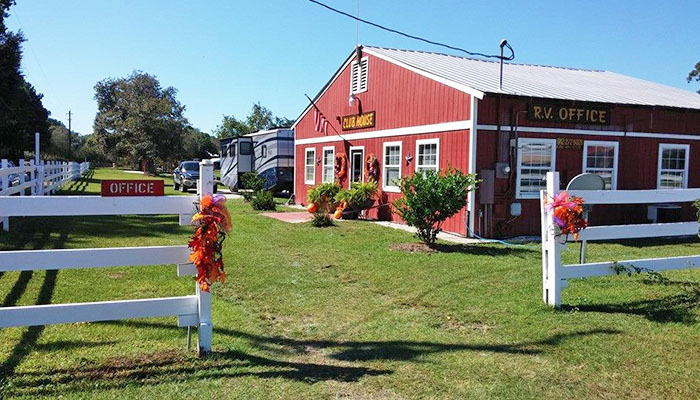 How many RV parks boast an antique and collectible store in addition to a killer location for unwinding in the privacy of the woods? 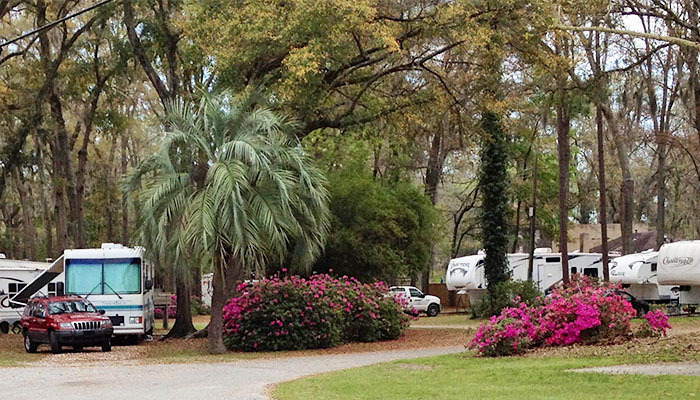 Count Biltmore RV among the few RV parks in Savannah that cater to bargain hunters and history buffs in the shade of 57-year-old oak trees. 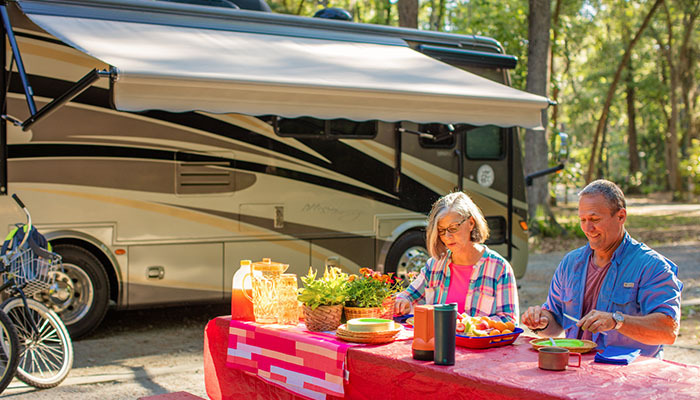 Camping veterans and their entourage settle down at Biltmore RV, a peaceful RV park, which has been family-owned and -operated since 1958. 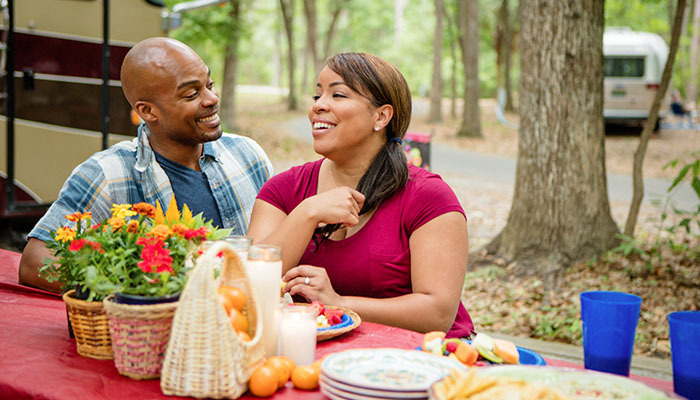 Its affordable and accommodating approach combines the natural beauty of the sites’ oak trees, Biltmore’s long-standing family-owned tradition and their undying affection for showing off Savannah to enthusiastic guests. 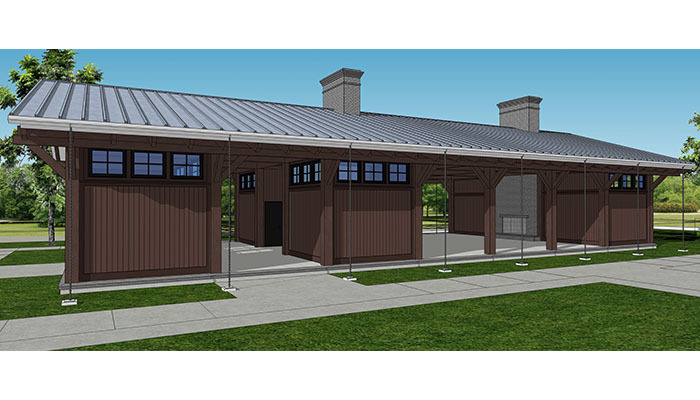 Each site is double the size of typical RV parks and preps guests for their stay with water, sewer, electric and cable hookups. 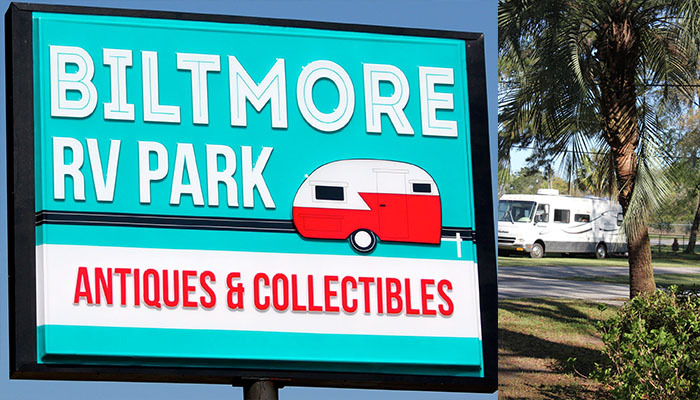 Cars are optional if campers seek to venture beyond their campsite and discover Downtown Savannah, but rentals can be delivered straight to Biltmore if guests so desire. 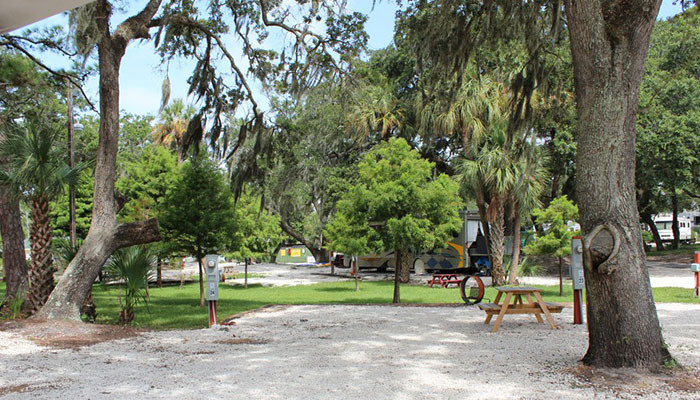 Trolley tours and city bus services also frequent this Savannah campground, making the city as accessible as each site’s table and chairs. 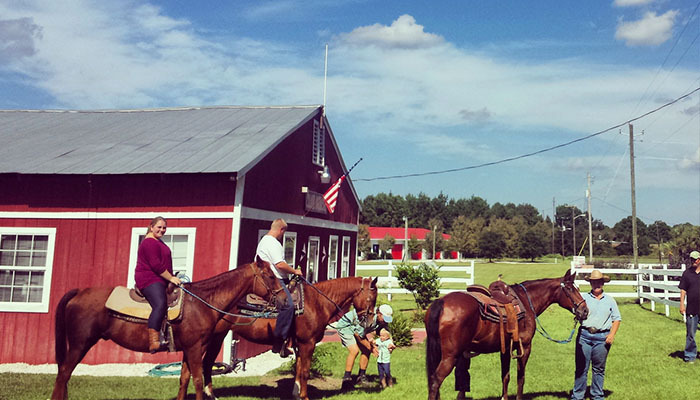 You don’t have to travel overseas or even across five states to feel worlds away from the everyday city/suburban life. 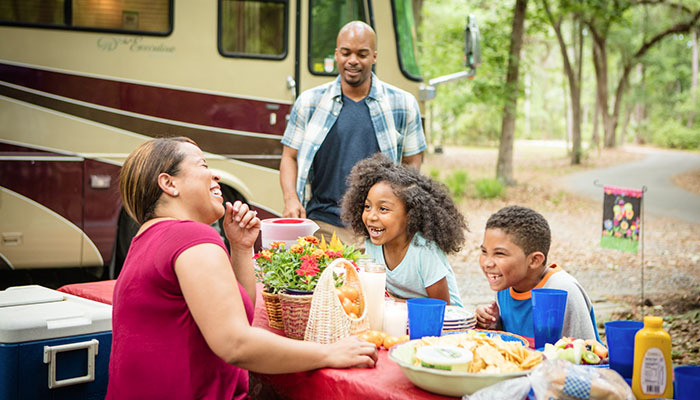 One of the goals of the upcoming RV must-do destination, CreekFire Motor Ranch, is to transport its guests to a natural nirvana without blocking out days worth of travel. 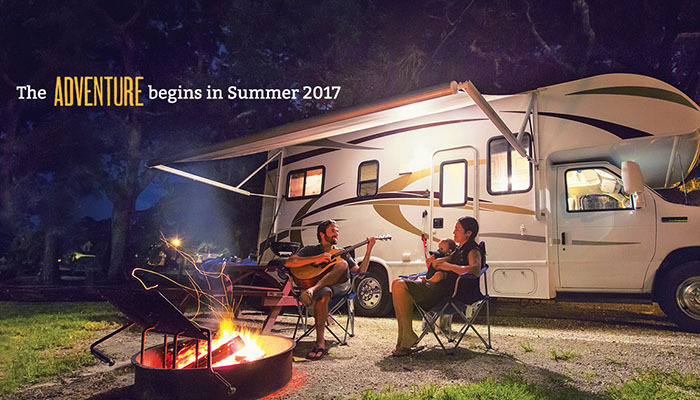 Coming summer 2017, CreekFire intends to pack the needs necessary for a successful, safe adventure with the wants of the 21st-century camper. 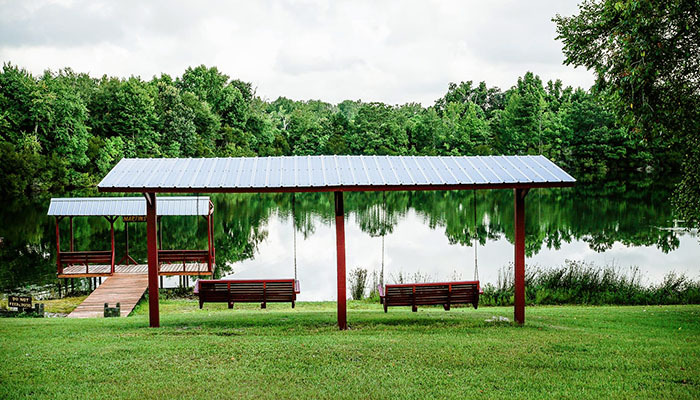 He who arrives in his RV will surely not remain there for the duration of his stay; This 105-acre ranch grants recreational leisure and pastime with a pool pavilion, tennis and basketball courts and a lake house for fishing supplies and boat and canoe rentals. 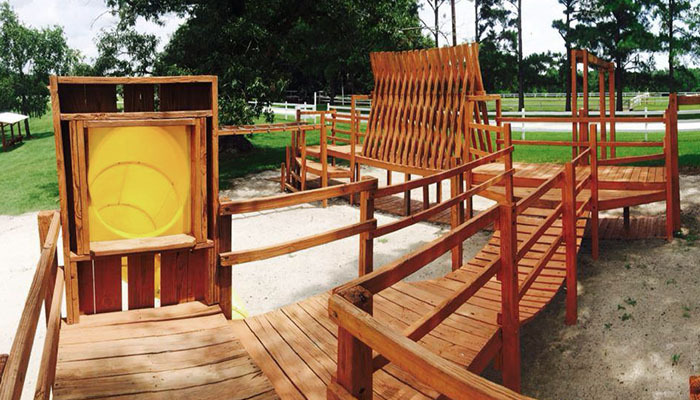 Golfers can flock to the driving range and those craving a little manual wheel action can rent bikes and explore a one-mile nature trail. 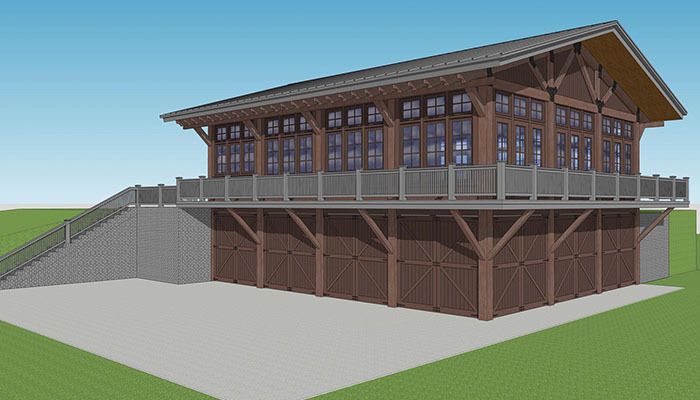 Guests will have access to a camper’s clubhouse complete with front desk service, a retail store and a computer center.